Recently a customer approached me with the question how to automate creating plans. The customer had tried to get this done and got stuck. I was pretty convinced I had never tried this. However, I looked into the automation examples I had created over the years and was quite surprised to find an example I created some years back. As always I thought it might be a good idea to share the code with the community. Wouldn’t it be nice if you could automate the process of managing timelines as much as possible? I think that would very beneficial and save a lot of time. Ultimately I’d like to have an example. Even bits and pieces could be interesting e.g. creating plans that are missing automatically. I recently had to manually do this for 12 plans and it was no fun. Please be aware that the code below uses classes that are not shipped in the plain java client libraries. They are part of the client SDK. require the library com.ibm.team.apt.common from the SDK. You can either copy it from the SDK and add it to the classpath or you add the SDK to your classpath. Please also note that beginning with RTC 6.x the Eclipse client does no longer support browsing plans. So it is unclear if some of the SDK classes mentioned above would be removed from the RTC Client SDK over time. Please note that the classes in com.ibm.js.team.api.workitem.common.utils are not shown in the code below, but they are part of the download. As always, please note, If you just get started with extending Rational Team Concert, or create API based automation, start reading this and the linked posts to get some guidance on how to set up your environment. Then I would suggest to read the article Extending Rational Team Concert 3.x and follow the Rational Team Concert 4.0 Extensions Workshop at least through the setup and Lab 1. This provides you with a development environment and with a lot of example code and information that is essential to get started. You should be able to use the following code in this environment and get your own extension working. As always lets look at how the code works a bit to understand it and be able to reuse it. The code is, as most of my code examples based on the code that comes with the snippets in the Plain Java Libraries and the code from examples on Jazz.net. The code comes in two Eclipse projects. Both are Plug In Development projects, because that allows me to use the Eclipse PDE to see, search and debug with the existing RTC SDK as described in Setting up Rational Team Concert for API Development and Understanding and Using the RTC Java Client API. It can later be run like any other java class. It is two projects, because the are several helper classes, that I reuse across other examples and I get tired copying the classes around. You can move them into your project if you like. I will take them under SCM and re-use them across solutions in the future, enhancing them over time as well. The main class is the usual structure that connects to the TeamPlatform and passes the parameters to the method run(). It needs a repository URI, a user ID and password to log in and do anything. The user must have the required permissions to perform the operation. A name for the plan. The iteration that is set for the plan. 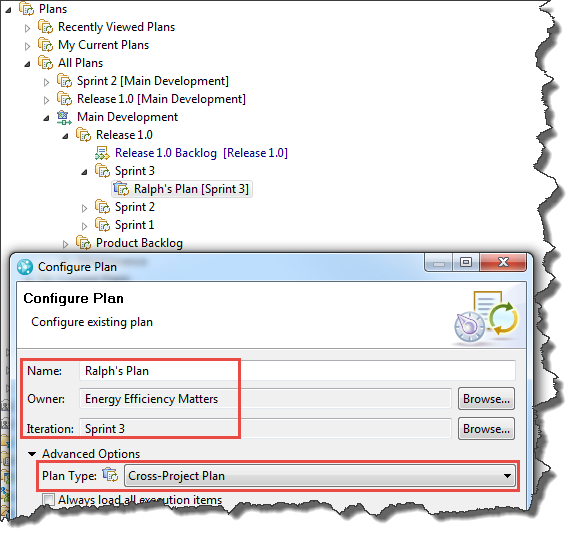 CreatePlan https://clm.example.com:9443/ccm/ ralph ralph "Ralph's Plan" "com.ibm.team.apt.plantype.crossProject" "JKE Banking (Change Management)/Energy Efficiency Matters" "Main Development/Release 1.0/Sprint 3"
The owning process area name is constructed as path created from the area names beginning with the Project area down to the nested process area we are interested in, separated by ‘/’. If the plan is owned by the project area take only that name. Use ” if the names have spaces. The iteration path is constructed from the name of the timeline and the parent iterations down to the iteration we are interested in, separated by ‘/’. Use ” if the names have spaces. You can also use the iteration ID’s with the same structure. The method run() gets the string representation of the required parameters. It tries to connect to the RTC server. Then it tries to find the owning process area using a small utility. It then tries to find the plan iteration. If it can find those, it calls a method that performs the plan creation. The plan is created using the method createPlan(). This method creates all the pieces needed for the plan. It uses internal API pretty much everywhere. It has to, the plan API is not supported and not made consumable. You have to be aware that internal API can change without notice and even without documentation how to replace the old approach. On the other hand, the internal API is also used in various places and it is likely to be needed in the future. The method gets all the required services. Then it creates the new Plan item and gets the IIterationPlanRecord that represents it. The next step is to set all the values for the plan configuration, name, owner, iteration and plan type ID. It is not apparent, but the plan needs also a wiki page to be able to save it. This wiki page is created next. Finally the plan is saved. If this succeeded, the new plan item interface is returned. The code looks like below. Please note the internal API. * (can not be null), name and plan type Id. The creator user can not be null. 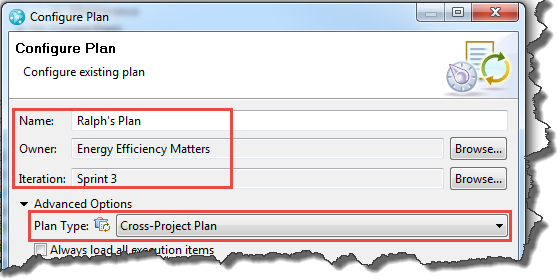 The example above shows how you can automate creation of plans. With some more code to create and maintain timelines, this can make RTC project administration a lot easier and remove repetitive tasks from your plate. This entry was posted in Jazz, RTC Automation and tagged client api, client library, java api administration automation, planning by rsjazz. Bookmark the permalink. Useful article, Ralph. Thank you. If creating 12 plans manually was not fun, imagine 500. – Adding the requiredService interface “com.ibm.team.apt.internal.common.rcp.IIterationPlanService” to the plugin dependencies. I am fully aware of the needs for automation that bigger projects have – this is why I try to do and publish as many examples as possible. I am pretty sure there is a lot out there. Unfortunately very few gets shared back to the community. Thanks for the server side. Where did you hook it up as server extension? Yeah, there is indeed room for improvement in automation, but RTC is already being surprisingly successful in complex Systems Engineering projects, thanks to its robustness, its open API and committed supporters like you. The server extension in which we are using above code is a Save Work Item Follow-up action. We know it’s not a common use case at all, but we have evaluated alternatives and this seems the most appropriate for our purpose. We’ll just have to test it thoroughly before going live.